9-year old Michael Mason from Fayetteville, New York! Mr. Ed Coombs of Cicero, New York was the 29th emailer for Ben’s March 2nd Birthday Contest (see post below). 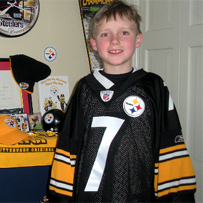 He won the prize – an autographed Ben Roethlisberger jersey. However, instead of keeping it for himself or his teenage son, he gave it to Michael Mason from Fayetteville NY. Now, both Ed and his son are big Steelers fans, but they thought that young Michael, the son of a friend and a HUGE Steelers and Big Ben fan would love the jersey even more! Judging from the photo, they were right! You can see a larger version of the photo as well as another photo of Michael with his new jersey here.